Topsham, Devon September 2, 2005 Dammit, for the fourth year running Kim has whooped the pants off me. It’s been a great year for boating and that means we’ve spent a lot of time at sea, fishing. Or in my case, trying to. 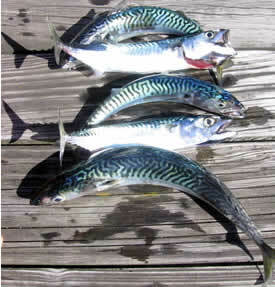 And while I’ve struggled to catch a single thing, Kim meanwhile has been pulling in mackerel by the dozen. “For bass fishing!” she says, handing me a book, ‘How to catch bass’. (It wasn't sub-titled 'For dummies' but it might as well have been). “Get ready with the bucket,” I shout, “This baby’s enormous! 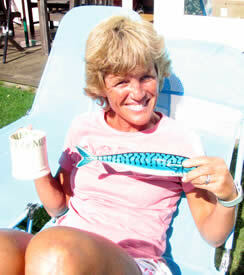 It will feed a whole rugby team!” It was unspoken that when I landed my first bass, Kim of course would be the one to deal with the flapping beaut – well, she’s had so much practise landing mackerel that she now has a good knack for extracting hooks from wriggling, angry fish, doesn’t she? As I have said already, I fully concede her superiority in many matters.